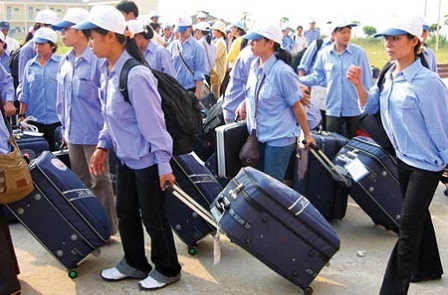 HA NOI (VNS) — Nearly 80,000 Vietnamese labourers went to work abroad from January to August this year, marking an increase of 8.21 per cent, over the same period last year, statistics from the Ministry of Labour, Invalids and Social Affairs' Overseas Labour Management Department (OLMD) show. With this figure, the country met 83.98 per cent of the target for this year. It had planned to send 90,000 workers abroad this year. During just the month of August, the statistics from enterprises show that the total of labourers working abroad was 11,255, of which 3,590 were women. Taiwan still ranked as the largest market for Vietnamese labourers during the first eight months of this year (6,455 workers), followed by Japan (2,222 workers), South Korea (1,038 workers), Malaysia (809 workers), Saudi Arabia (172 workers), Macao (China) (45 workers) and other markets. Over the last few years, Taiwan has continuously been the market which received the highest number of Vietnamese workers. It recently reopened its doors to welcome Vietnamese workers for two kinds of jobs: fishing boat members and nurses to tend to old people and patients. In August, the OLMD selected 47 enterprises which can provide Vietnamese nurses for families and 14 enterprises which can provide fishing boat members willing to work in Taiwan. According to the Department, the enterprises sending workers to Taiwan have to provide enough training to the workers, and should not have suffered administrative fines when sending labourers to work abroad.